Airport construction, particularly the redevelopment of an existing terminal, is among the most complex of construction projects. The vast range of technical standards, legislative requirements and logistical challenges, let alone designing something that looks the part, has kept me awake on numerous occasions since my first role at London Heathrow. But it’s worth it. During eight years of walking through airport terminals every day, I have seen couples kiss each other farewell, friends welcome each other home, and even helped an excited Olympian carry a pole vault through customs on her way to the 2012 games. Airports are the backdrops to some of the most poignant moments we’ll encounter and have a sense of energy that is second to none. Aberdeen International Airport welcomed its first passengers in 1978 and has seen its own share of farewells and homecomings. 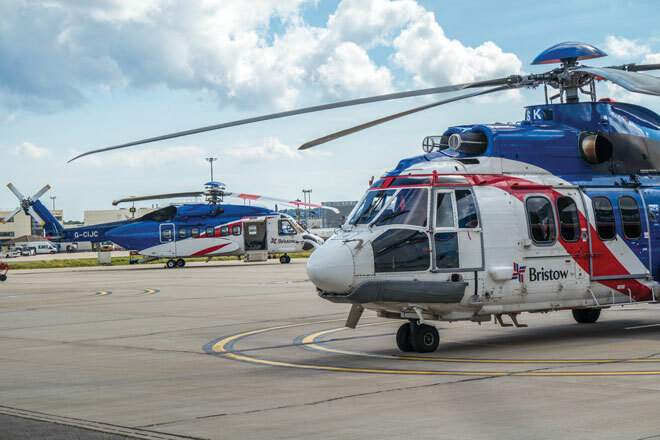 Serving Europe’s energy capital, the centre of the North Sea oil industry, the airport is the north east of Scotland’s major transport hub and is a vital economic driver for the region, contributing more than £110 million a year to the local economy. It is also the world’s busiest heliport. The average propensity to fly of the Aberdeen region (passenger numbers divided by the catchment population) is almost double that of the UK at 5.2 times per year. Additionally, over 60% of passengers are business travellers. This leads to increased usage of business lounges and high passenger expectations. The airport has seen rapid growth of over 25% in the last four years, reaching a record high for passenger numbers in 2014 of 3.7 million. 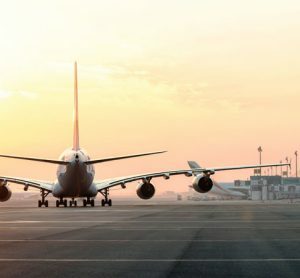 This has placed considerable pressure on every aspect of the airport’s facilities; creating chronic capacity constraints in both the departures and arrivals passenger journeys. In a 2014 survey of business leaders by Aberdeen Chamber of Commerce, 89% of respondents identified expansion of the airport as the region’s most pressing infrastructure project. Whilst the situation has become less pronounced recently due to the global drop in oil price, 2015 represents the airport’s second busiest year and the management team recognise that a development plan is required to cater to passenger growth over the coming decades. 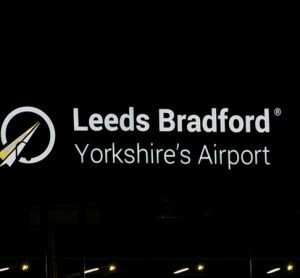 We were therefore delighted to announce an investment of over £20 million earlier this year to comprehensively transform the airport. Spread over three years, the project will double the size of security search, immigration, and baggage reclaim and create an exciting new retail environment in the departure lounge. First Minister Nicola Sturgeon launched the project. 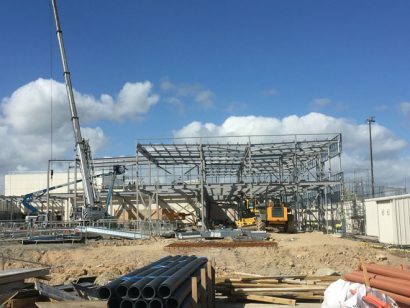 She said: “This investment by Aberdeen International Airport and its owners shows great ambition and confidence in the Airport’s future in preparing for projected growth. By increasing capacity and improving the passenger experience, the Airport is making a clear statement of intent and the North East and Scotland will see the benefit. The announcement was welcomed across the region. James Bream, Research & Policy Director at Aberdeen & Grampian Chamber of Commerce, commented: “The investment is fantastic news for Aberdeen International Airport and its customers. The airport is our gateway to regional and international markets and the ambitious development plans are fitting for a globally significant city. Work commenced on Phase 1, the construction of a new 5,800m2 terminal extension, in June 2016 and is scheduled to be completed by summer 2017. 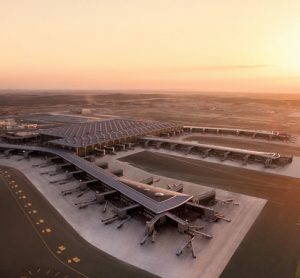 The extension is a crucial element of the airport’s transformation, creating additional space into which facilities may be decanted from the existing terminal. Business lounges, immigration, and both domestic and international baggage reclaim facilities will move from cramped spaces, original to the 1978 terminal, to modern and airy facilities fit for the 21st century. This also paves the way for the reconfiguration of the existing terminal during Phases 2 and 3.
Business lounges benefit from panoramic views of the airfield, while skylight glazing in the baggage reclaim facilities will allow natural light to reach the centre of the plan. Bold passenger wayfinding signage will be supported by lighting design to guide users through circulation space and accentuate key dwell areas. Externally, the extension will be clad in dark composite cladding to act as a counterpoint to the original terminal and provide an indication of the contemporary spaces within. Emphasis has been placed on delivering maximum impact within our available budget. The construction cost of the terminal extension, in terms of cost per square metre, is one of the lowest of recent UK airport developments. However, we are determined to offer passengers a high quality product, both inside and out. While this is a wonderful opportunity, it presents particular technical challenges. In order to create space for the new extension, it has been necessary to temporarily relocate immigration and international and domestic baggage reclaim to sites elsewhere. Domestic reclaim has been accommodated on the terminal’s front forecourt. Immigration and international reclaim is situated on the airside apron. Both facilities required substantial changes to their supporting infrastructure and processes and were thoroughly tested with volunteers acting as ‘passengers’ prior to opening day. It was a considerable relief to watch the first passengers reclaiming their luggage in late May 2016, having passed through temporary immigration facilities complete with full provision of passport control and IT to support Border Control procedures. Positive collaboration with our partners at UK Border Force was key to successfully delivering the temporary facilities on schedule. Strong relationships will become even more important as we move towards completing the terminal extension and embarking on Phases 2 and 3. Few organisations are as reliant on successful relationships with business partners as airports are, and Aberdeen is no different. Phase 2, due to be completed in summer 2018, will more than double the size of security search and utilise automated tray return and extended repacking areas to ease passengers’ journeys through what can be a stressful process. This will be supported by a ‘decompression’ area where passengers can check their flight status and gather their thoughts before proceeding through a new and enlarged duty free retail unit. 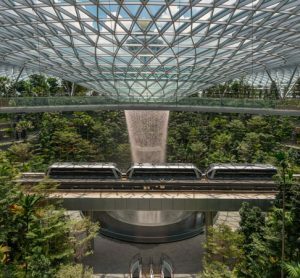 Again, positive collaboration is key to ensuring that passengers get the most out of the retail experience and that the unit meets the needs of both the operator and the airport. This precedent is continued in Phase 3, the wholesale reconfiguration of the airside departure lounge. Throughout 2018 and 2019, retailers will be relocated to more spacious units, whilst the delivery of additional units creates an opportunity for exciting new retailers to support the existing offer. The retail environment has been planned to enable clear site lines across the lounge and to ensure that circulation space is ample. The enclosed and crowded nature of the existing lounge is a regular source of feedback so this is an exciting opportunity to transform the experience of departing passengers. Within the next three years, Aberdeen International Airport will be transformed into a facility fit for the 21st century. Upon completion of Phase 3, the airport’s facilities will be capable of accommodating projected passenger growth up to 2025. An outline layout has also been developed to meet growth needs up to 2045 and space to deliver this expansion is already being safeguarded as part of the current design. My personal goal is to deliver an airport terminal that our passengers and region can be proud of and to ensure that passenger disruption is minimised during the construction period. Keep an eye on the airport website and social media channels for the latest information during this extremely exciting time. 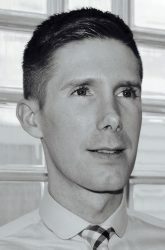 John Deffenbaugh joined Aberdeen International Airport in April 2014 after four years with Heathrow Airport as design manager on the T4 Futures project and commercial planning manager for the construction of T2. Prior to that, he worked in a range of roles including public realm project manager for the City of London, design advisor at Edinburgh council, architect in commercial practice, and tour guide at Buckingham Palace.